Christian McKay Heidicker watched a lot of TV as a kid. (Probably too much.) It disturbs/enthralls him to think that the characters he was watching were sentient. (They probably were.) 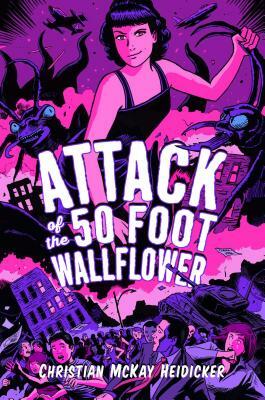 Attack of the 50 Foot Wallflower is his second novel. His first novel, Cure for the Common Universe, was about how he plays too many video games. Learn more at CMHeidicker.com. "This book is wild, weird, hilarious, heartfelt, imaginative, and inventive. The spirit of Kurt Vonnegut is alive and well in its pages." "In Heidicker’s funny, feminist send-up of B-movie cinema, selectively blind nostalgia, and TV binge watching, a teen girl living within a mysteriously connected string of monster movies learns to control her own narrative...frighteningly fun." "This is a wonderful and wholly unique entry in teen horror fiction." "Phoebe is a plucky, snarky heroine, and her fantastic adventure will entertain teens."